This cover is everything for me. Wow and wow. That’s Tokyo. And that’s his cat Kevin (who likes ice cream). And that’s the garden that grows. Isn’t it wonderful? This is a story about cities and nature with a boy, a grandfather, and a cat at its center. It echoes fairy tales with its magic. With the way the boy is mysteriously chosen by an old woman. And, of course, the three seeds she gives him. The way they contain a wish. And I love how we are never told what Kevin’s wish is. But we know. Because he’s heard those stories from his grandfather about a time with salmon and streams, a time that’s now gone. That’s been eaten. This pair of lines serves as bookends. Cities do have to eat! Gardens do have to grow! How can we make the two work together, the book asks? Can we get used to a new way of life in cities? What would happen if nature took over us the way we’ve taken over nature? Nature taking over doesn’t, in the end, feel apocalyptic. It feels pretty cool. Like something we can work around and learn to like (rowing to work and sloths in the elevator, for example). And the story never feels like a treatise. It feels like a flight of fancy about how the world could be. I was lucky enough to have both author and illustrator answer some interview questions! First up, author Jon-Erik Lappano! This Picture Book Life: Please tell us about naming your main character Tokyo and how that relates to what you envisioned for the setting of the book. What significance does Tokyo have to you? Jon-Erik Lappano: There’s definitely a backstory with Tokyo. I first came up with the idea for the story while working as a landscaper in the centre of Toronto, Canada, transforming tiny backyards and rooftops into mini-ecosystems. 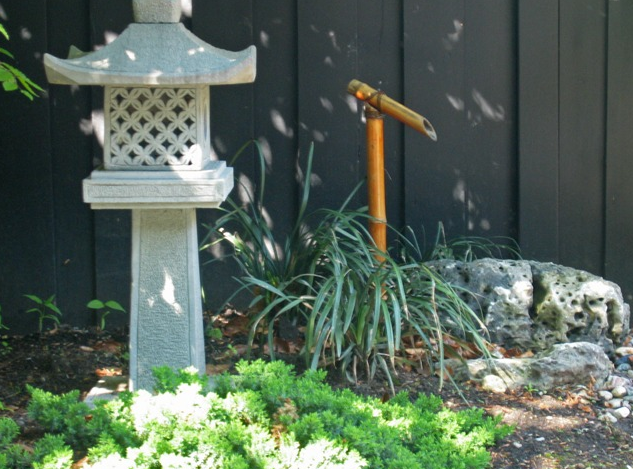 The gardens we designed in the early years were heavily influenced by Japanese aesthetic, as the owner of the company had spent time apprenticing in Tokyo. One of the first projects I worked on was designing and installing a small pond with a bamboo water spout. I was taught about the art of Suiseki, which translates to “stone appreciation,” and spent hours carefully placing boulders to frame the water feature. I so wholeheartedly embraced the process, that my boss affectionately referred to me as “To-chan,” a nickname you might give to a younger brother named Tokyo. The name has reverberated in my head since then. I had the title for at least a decade before I had written anything down. Tokyo Digs a Garden was always there in the back of my mind, scrawled on notebooks with accompanying doodles of Tokyo and his wild urban garden. I loved the contrast in naming a small, thoughtful boy after the world’s largest mega-city. I also felt Tokyo was a really unlikely name for a main character, which added to the general weirdness of the story. Fun-fact: Kevin the cat is based on a stray (and well-fed) cat named Kevin that hung out in my apartment for a few weeks around the same time. I’m sure he’s still out there, somewhere, roaming the alleyways of Toronto. TPBL: Why did you want to write this book? JL: I’m an environmentalist at heart, and I’ve always worked in sustainability (formerly as a journalist, a youth educator, and now leading the communications of a Canadian environmental non-profit). I wonder if the reason for our ill-treatment of our environment begins with the disconnection we draw between ourselves and the ‘natural world.’ I never understood that separation — we’re a part of it. I wanted to write this book to convey the idea to children that our cities are also natural places. They’re teeming with the wild, we just need to let it out a bit. We shouldn’t have to retreat to the wilderness to discover a love of nature. We can cultivate an environmental ethic in the cityscapes where many of us live. Weeds push through cracks in pavement, birds nest in windowsills, and people (animals) set up shop in concrete and timber and steel and glass. The point is, we’re all part of the same ecosystem; ours just looks starkly different and has typically destroyed whatever lies in its path – but it doesn’t have to be that way, and earth is not so easily defeated. With an increase in green urban design, biomimicry and low-carbon infrastructure, I think we’re starting to get that. Tokyo Digs a Garden is less about living in harmony in nature (although that’s certainly important), and more about understanding that the wild is waiting beneath the bricks and concrete of our cities. The ecological memory of what our cities once were is just beneath the surface, and the wilderness will absolutely return and flourish, if given the chance. TPBL: I love the way Tokyo’s parents are only mentioned in passing, to further the story of how the garden is changing the city. How did you decide to have his grandfather be Tokyo’s co-star? JL: Tokyo is a child of working parents, which I felt was a likely indicator of his family’s economic status (being in a tiny house that has been swallowed up by the pace of growth). It made sense to me that he’d spend most of his days with his grandfather. I’m a parent of two wonderful, imaginative, and wild young children. My partner Stephanie and I are lucky to get to spend a lot of time with them, but we love that they also learn from others in their lives. There is a richness and depth to intergenerational relationships that can’t be passed on from parent to child. They are relationships that are often short-lived and important to cherish. I think this is especially true when gaining knowledge of our environments (natural or built). When things change as fast as they do, it’s important to be able to time-travel through the stories of our elders. We’re pretty wrapped up in instantaneous time. Stories from close to a century ago at least root us to timelines that are closer to the natural rhythm of things. 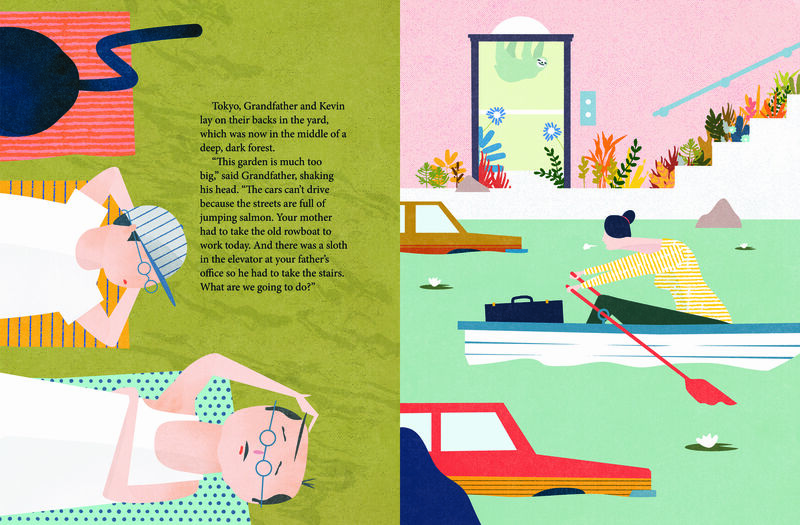 Tokyo’s grandfather can tell stories of the way things used to be – not to go back, but to put their lives in context. Only Tokyo and his grandfather have the space and time to let their imaginations run as wild as the garden they plant: one stems from the boundless possibility of childhood, the other from the visceral imagery of nostalgia. This kept lines of reality blurred in the story, which made it a lot of fun to write: did the garden really grow or is it an imaginary pact between the two generations? TPBL: What was your favorite thing about first seeing Kellen Hatanaka’s illustrations? How did they surprise you or further tell the story in a way you admired? JL: I’m a huge fan of Kellen’s work. My home office is plastered with his prints. Getting the opportunity to collaborate with him was so exciting. His illustrations brought a vibrancy and quirky humour to the story that simply wasn’t there before. His brilliant use of collage and colour added a sense of surreality to the book that I think took it to strange and exciting new places. He brought Kevin and his quest for ice-cream to life. I also love the other-worldly body types Kellen used for characters in the book, especially the old woman who gives Tokyo the seeds and Grandfather, of course. Grandfather is the coolest. I want to hang out with that guy, and eat whatever they are having for lunch on that spread. My 2 and 4 year old daughters also love pouring over every page pointing out the endless details in the illustrations. The illustrations keep their attention, which opens up the space for storytelling. Next up, illustrator Kellen Hatanaka! This Picture Book Life: How did you come to work on this project and what drew you to it after reading the manuscript? Kellen Hatanaka: Jon-Erik is actually my brother-in-law, so we’ve known each other long before the idea of publishing this book came about. I think he and I were driving back from a family gathering and we got to talking about this idea for a story he had come up with while working as a landscaper. I instantly fell in love with the story and the characters. At the time I had already published my first book, Work: An Occupational ABC, with Groundwood and was in the process of pitching ideas for my follow up. Jon-Erik had a manuscript ready to go so I suggested that I send it over to Groundwood to see if there was any interest. TPBL: The way you transform the city from modern and full of symbols to lush and more livable is incredible. One detail I especially admire is the way the muted buildings at the start have features that give them faces, as though they’re the things that are alive in this place rather than the people. Machines are “eating” a tree by cutting it down with utensil-shaped implements. And the billboards! A hamburger billboard changes to one featuring veggies. Will you talk about your intent and process with some or all of those elements? KH: The city’s transformation is one of the most important aspects of the book and one of the most difficult challenges that I faced while creating the illustrations. I wanted to make sure that there were clear visual cues to communicate the transition from the congested city to the lush Utopian landscape. The obvious change is that the vegetation becomes over grown and wild, but I wanted the change to feel more severe than just the introduction of a few plants to the roof tops. Starting with a greyed-out, dingy landscape really helped to communicate that the new city was a bright, sunny, and clean place. Working with another person’s story I feel a great obligation to do their work justice. I was particularly concerned about the line “city’s have to eat something after all.” I love that imagery and I wanted to find a way to capture that sentiment without being too heavy handed. I knew that I wanted to represent the image of the city eating in a literal way, but at the same time I wanted the hints to be subtle. 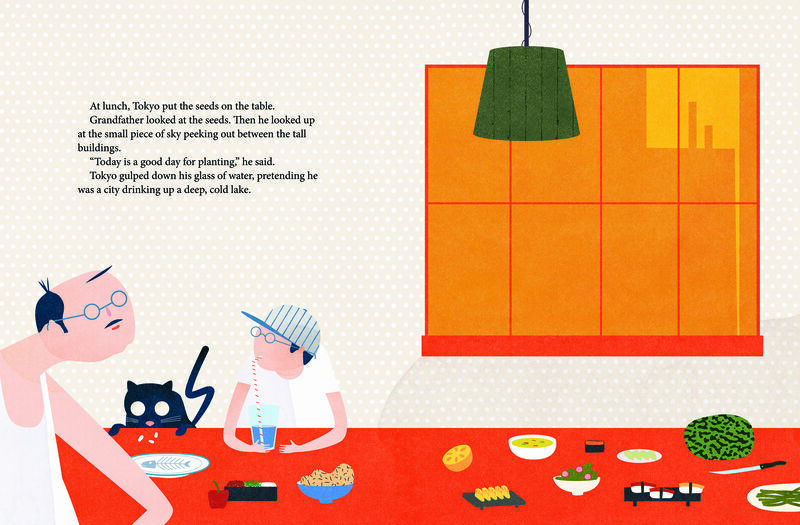 I like the fact that you might not notice all of the visual references to food right away. TPBL: Who are some of your favorite picture book illustrators right now/big influences of yours? KH: There are so many amazing picture book illustrators out there that it is really difficult to narrow it down. 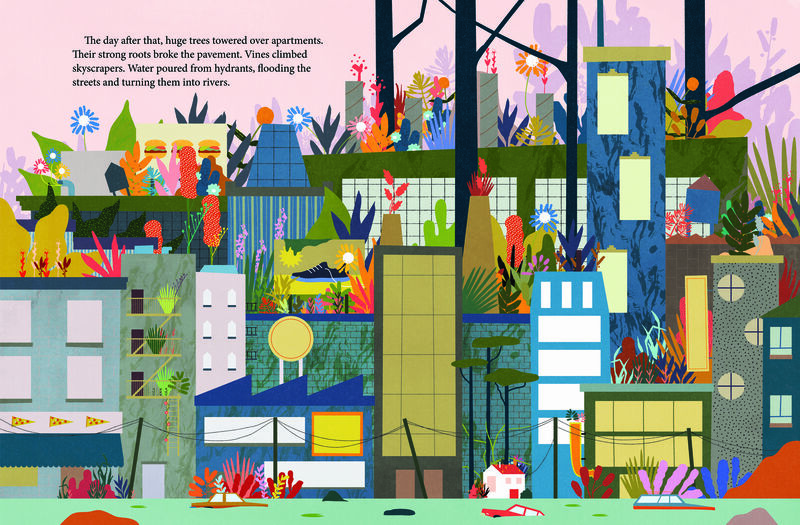 Jon Klassen, Oliver Jeffers, Chris Haughton and Joohee Yoon are a few of my favorites. My influences and inspiration come from a wide variety of art, design and random imagery that I come across day to day. Huge thanks to both Jon-Erik and Kellen for stopping by! read the book, dig a garden! Heart eyes emoji is right!! 🙂 Thanks for stopping by, Rebecca. I think you’ll love this one. What a wonderful review! Would you consider linking it up with the Diverse Children’s Books Link-up? You can find it at http://pagesandmargins.wordpress.com/2016/05/07/diverse-childrens-books-link-up-2/. Thanks!